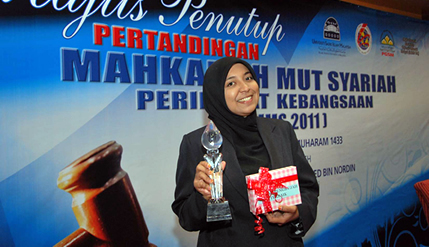 BANGI, 4 Jan 2012 – A Third Year student at the Syariah Department, Faculty of Islamic Studies UKM, Syamimi Ab Rahman, won the Best Advocate award at the National Level Syariah Court Moot Competition 2011 held 10 and 11 December. Her victory was a boost to the UKM team which faced students from Universiti Sains Islam Malaysia (USIM) in the final. However, the UKM team – represented by Nor Salwa Abdullah Thani, Nur Sabrina Abdul Hamid, Nor Hafizah Haron, Madihah Ismail and Syamimi – lost to the team from USIM, which is also the defending champion. The UKM team was under the guidance of Associate Prof. Dr Zaini Nasohah. As the best advocate Syamimi received a cash prize of RM1,500 and a trophy. Syamimi told UKM News Portal that in the preliminary stage the UKM team beat students from Universiti Utara Malaysia (UUM). In the final, the UKM team was the proposer in the debate on Child Care Rights and brought along reference books, laptops and printers to back up its argument. In the competition held at USIM seven institutions of higher education took part. Besides UKM and USIM, the other teams were from the International Islamic University of Malaysia (UIAM), Universiti Malaya (UM), UUM, Universiti Sultan Zainal Abidin (UNISZA) and the Selangor Islamic University College. It was organised by USIM together with the Higher Education Ministry, the Disciplinary Council of Malaysian Universities and the Malaysian Association of Syariah Lawyers. Deputy Higher Education Minister Dato’ Saifuddin Abdullah presented the awards. The competition was first held in 2009.